This is an awesome, slightly matte, somewhat empathic crystal, 1.5 oz, 1.9” by 1.5” by 0.9”, and from Brazil. She is a DT, but through the eons her upper termination was damaged and healed (although the healed area has since sustained a ding). The base is rather rugged looking with insets of quartz druse, golden healer and a bit of calcite. 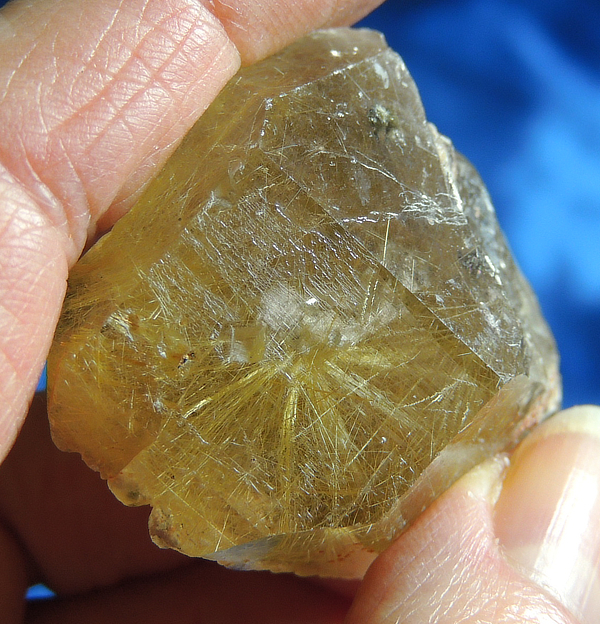 But work with her in the sunlight and she will show you a glorious display of golden rutile, including a super-nova starburst of it! Although a bit rugged, she makes a wonderful pocket stone for any time you just need a bit of sunshine!